Raise your hand if you crave fast weeknight dinners that are easy, nourishing, and require little to no cleanup. 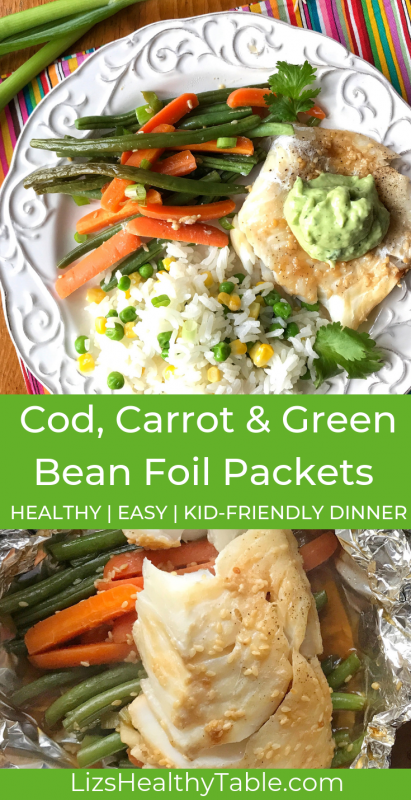 This foil-pack dinner recipe for Cod, Carrot & Green Bean Foil Packets fits the bill. It calls for mild-flavored cod (any other firm white fish or even salmon would work just as well), baby carrots, French green beans, Soyaki (a bottled Asian sauce I get at Trader Joe’s) and a zesty avocado topping made with lime zest, lime juice, cilantro, and plain Greek yogurt. 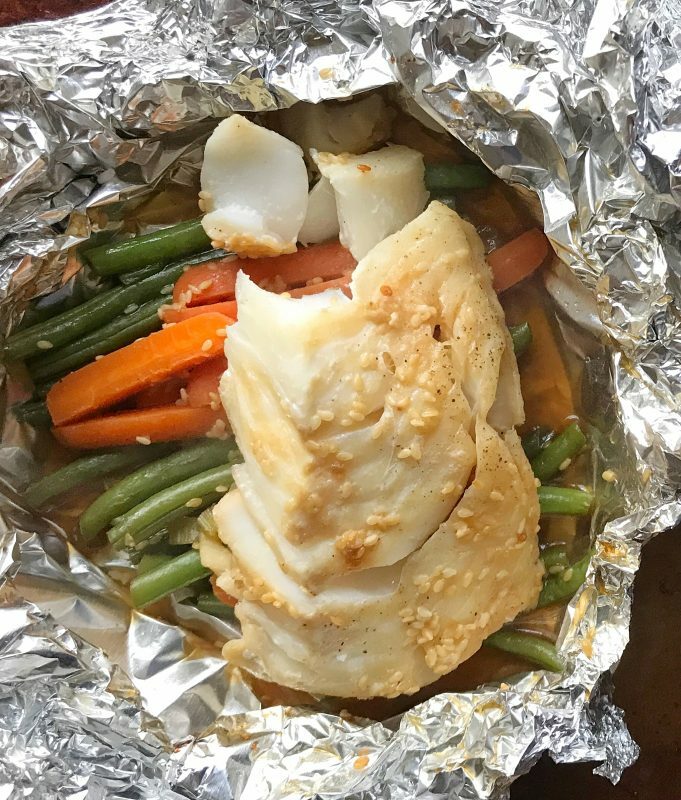 Cooking dinner in foil packets is a hot 2019 food trend according to the New York Times. I love the trend because it’s super easy, and cooking in packets lends itself to nutritious ingredients like seafood, chicken, and vegetables. Hear all about the recipe on this week’s Liz’s Healthy Table podcast. 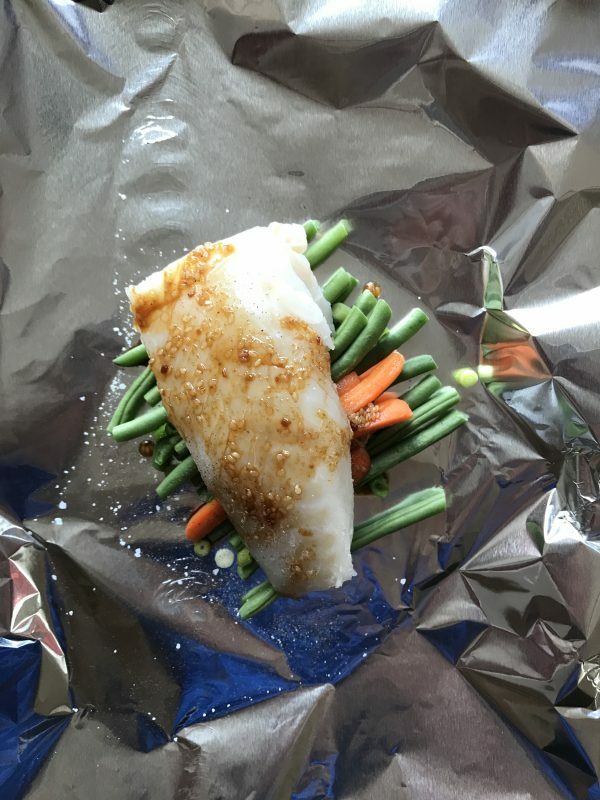 Cooking meals in a packet—also known by the French term, en papillote—may sound fancy, but it’s super simple and can easily be done at home. 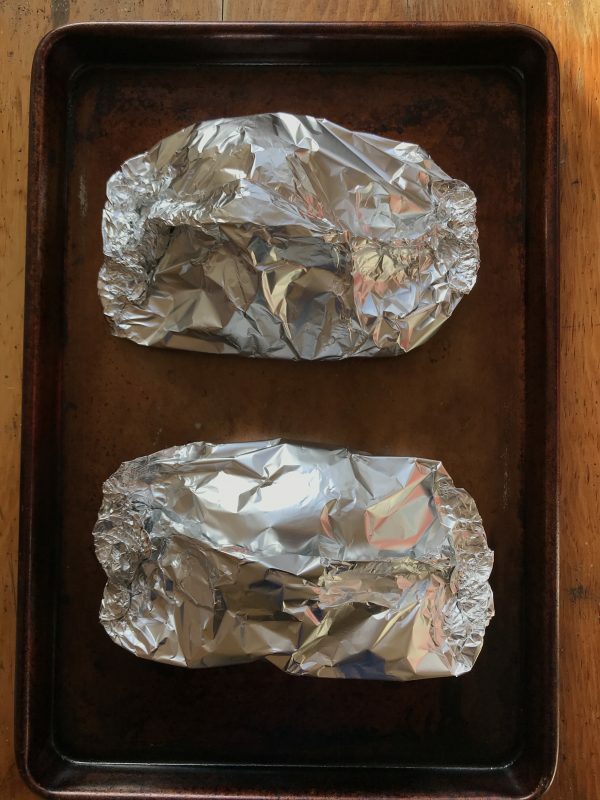 All it requires is placing your ingredients in the center of a piece of aluminum foil or parchment paper, wrapping everything up into individual packets, and then baking in the oven … or over a campfire. To close the packs, bring up the sides of the foil and fold over twice to double seal. Then seal the ends, making sure to leave a bit of room in the packets for the heat to circulate. Place the packets on a sheet pan or baking sheet, pop into the oven, and in less than 20 minutes, dinner is done. The versatility of foil pack dinners can’t be beat. Choose your favorite vegetables, protein, and sauce, and you’re good to go. If you don't have a Trader Joe's in your area and can't find Soyaki, use teriyaki sauce and a sprinkle of sesame seeds instead. You can change up the flavor profile of this recipe entirely by using your favorite Italian vinaigrette instead of the teriyaki sauce and fresh basil or parsley instead of cilantro in the avocado sauce. 1½ cups baby carrots, each cut lengthwise into 4 thin "matchsticks"
Cut four 17-inch rectangular pieces of aluminum foil and place on a work surface. Seal each packet by bringing up the sides and folding the top edge over twice. Seal the edges in the same way. Place the packets on a baking sheet and bake until the fish is cooked through and the vegetables are tender, 15 to18 minutes. While the fish is in the oven, place the avocado quarters, half the cilantro, yogurt, lime zest, lime juice, salt, and pepper in the bowl of a mini food processor. Process until smooth, stopping a few times to scrape down the sides of the bowl. Season with additional salt and pepper to taste. Open the packets carefully (be mindful of the steam! 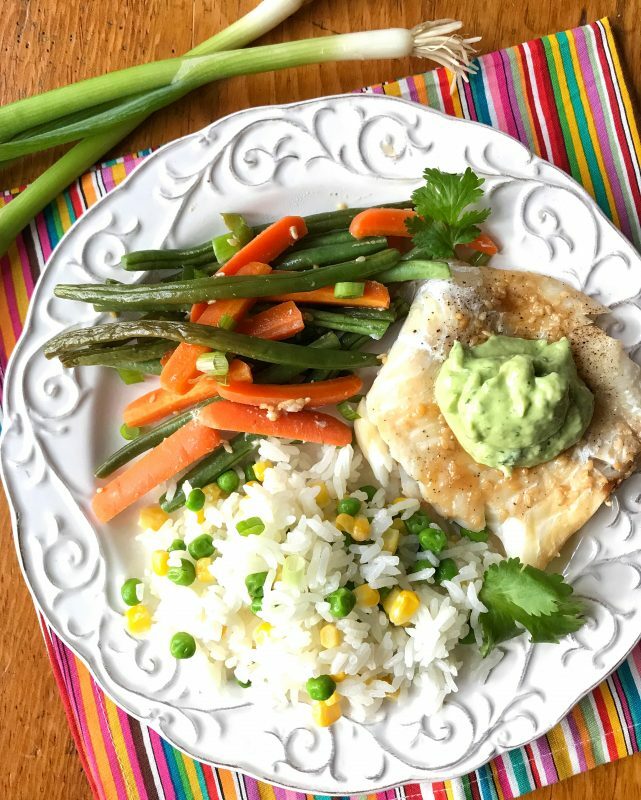 ), Place the fish and vegetables on a plate and top with the avocado sauce and the remaining green onion and cilantro leaves. 198% vitamin A per serving! Thank you carrots!! Be sure to check out my recipe roundup featuring a dozen other foil-pack dinners. Love the recipe? PIN it! Thank you, Liz! I’m so excited to try this recipe! It looks like one that my somewhat picky husband might like, and we’re trying to have fish twice a week, or at least once a week. Again, thank you! Thank you, Liz! My “somewhat picky husband” really liked this recipe! He wasn’t crazy about the avocado topping, but he really enjoyed the fish and veggies with the Soyaki sauce. So this is a keeper! 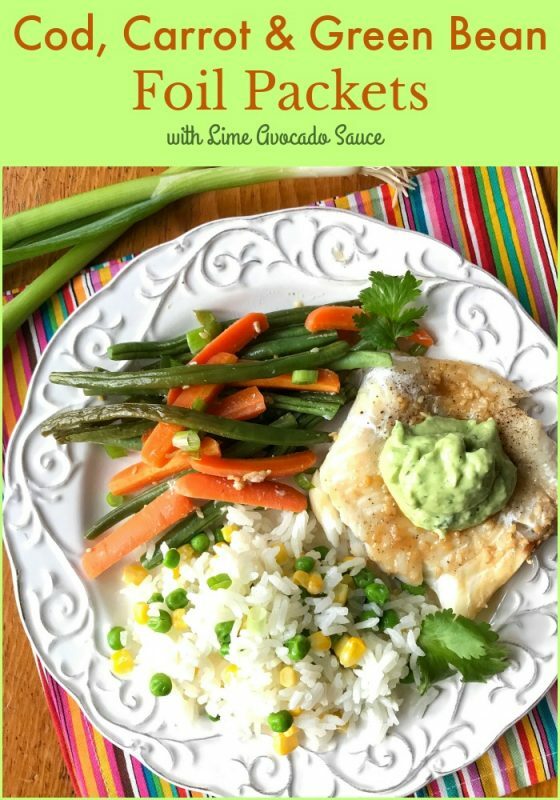 I really liked the avocado sauce with the fish, so I’ll probably still make the sauce for myself, but I’ll serve him the fish and veggie without it. I can totally see that this recipe could be adaptable with other seasonings and veggies, too. Oh, and I made it with tilapia fillets, because that’s what we had on hand, and it worked with the same baking time. Thank you!! !